Few years ago I wrote for my own amusement the first version of this pic. This image is generated « on the fly » with datas extract from the Dx Cluster . 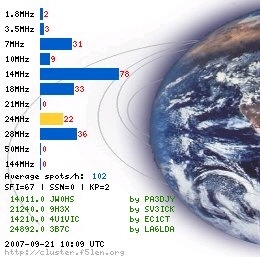 The goal is to provide a graphical view of the ham radio activity on all HF bands, 6m and 2m band. The datas are provide from the lasts 250 dx spots. – if the bar is bleue, that’s mean that the activity on the band is normal or less. – if the bar is yellow, the activity of the band is above the normal. – derivated rate of the dx spots (average/hour). – some informations about the sun like SFI and SSN . How « normal » band activity is estimated? For each band a statistic spot/mn indice was estimated from more than 3 millions of dxspots. This amount of spots were collected on the cluster network other the pasts 3 years. By this way, the actual activity of a band is compare with the « normal » activity estimated earlier. Some weighting have to be done, because of the time dependent activity of each band (ie: 80m is more active during the night than in the daylight). How to insert this image in a web page? Dx cluster is a great tool, but remember that the best way to dxing is L I S T E N I N G!